Steven (Chicagoland, United States) on 5 June 2018 in Plant & Nature and Portfolio. Photo captured May 13, 2018. Très jolies fleurs, et je ne connaissais pas le Pommetier, je suis aller voir de quoi il retournait. Oh so that's what the flower looks like before the fruit! They're so pretty aren't they?! I can feel fresh air here ! Bonjour Steven! Quel beau bouquet douceur, superbe photo! Bise, bonne journée dans la joie! A beautiful capture of these delicate blossoms. The shades of green here are very pleasant. Super image. They are beautiful in this light. Excellent shot. A fine capture of the blossom's beauty. Well done. Superb!!! Parece como si las flores quisieran salir de la pantalla! Have you tried crabapple jam before? 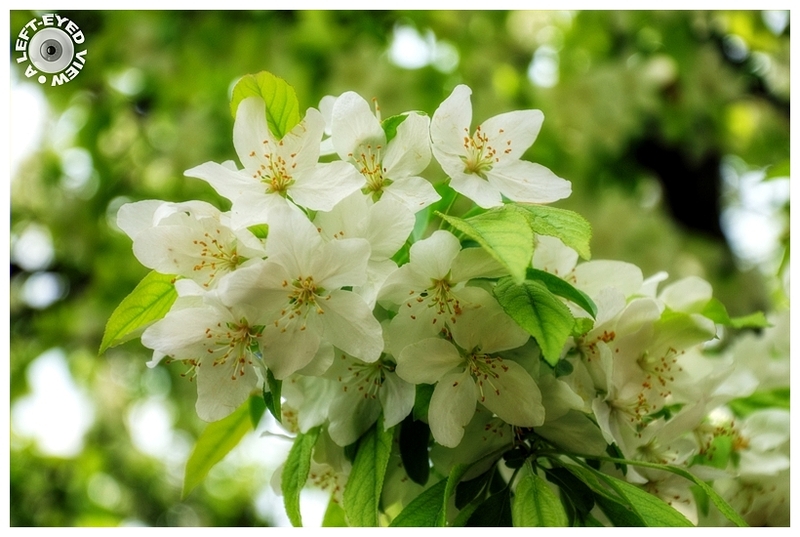 Splendides fleurs blanches aux fines étamines entourées de feuilles vert tendre ! They are just gorgeous. I always find the white flowers with green very appealing. This is just lovely. Spring is vigorous on these sides. Here, just rains... it looks like autumn. So pretty! We had a crabapple tree outside my bedroom where I grew up in Laramie, Wyoming. I loved just opening the window, grabbing a couple of those little morsels of tartness and snacking... any time they were in fruit!